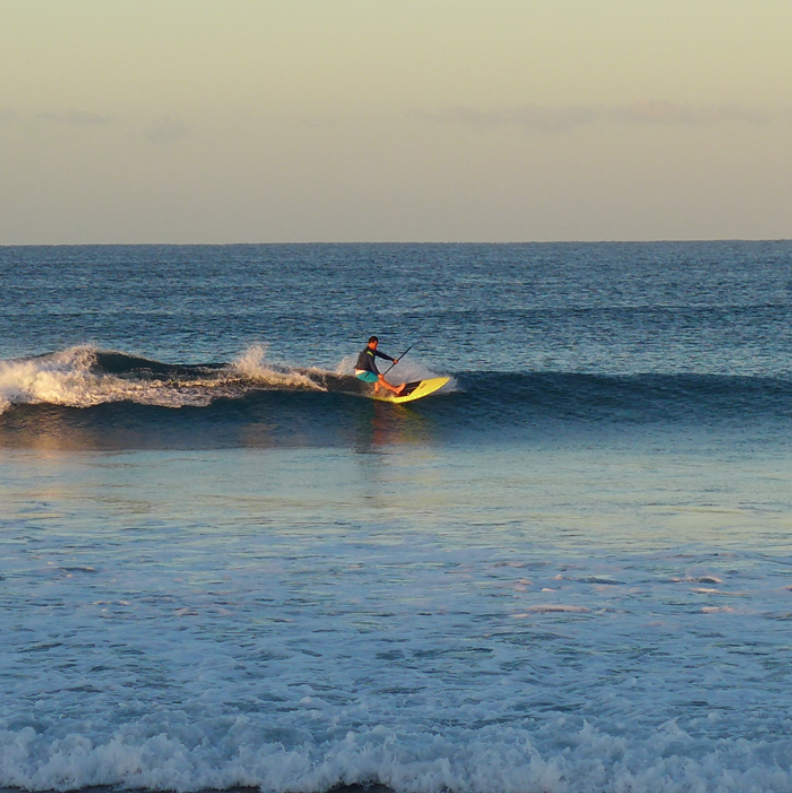 Evidently, I had been a good boy- the surf was chest to head high, the wind was offshore and the water was crystal clear. 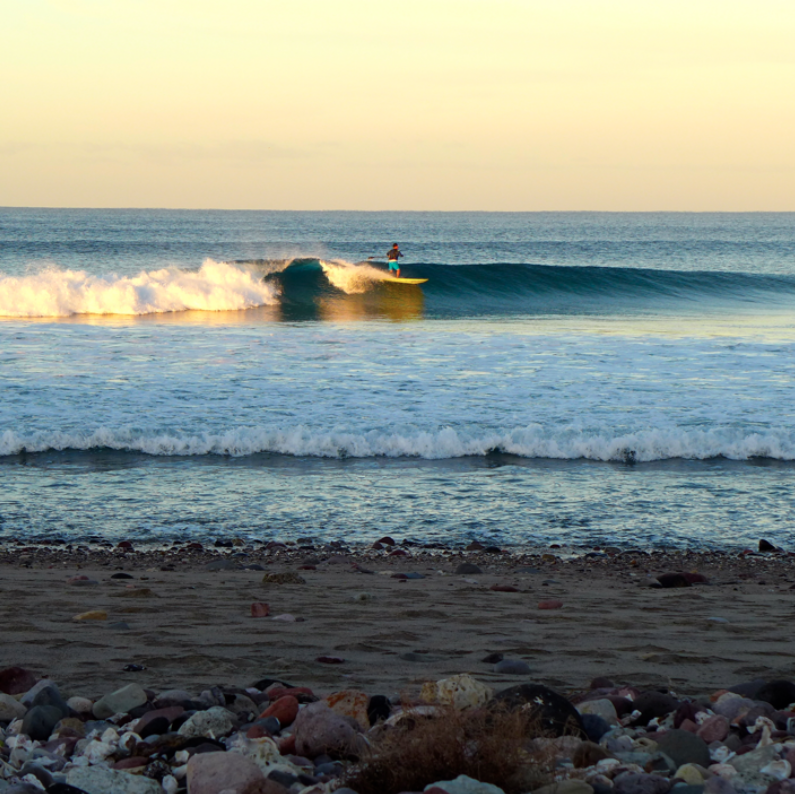 At daybreak, I was out there! For a couple of early hours, it was just me and these two guys. The two buddies were camping out of a Toyota Previa fan, surfing weird boards, playing guitar and basically establishing themselves as the kings of their world. 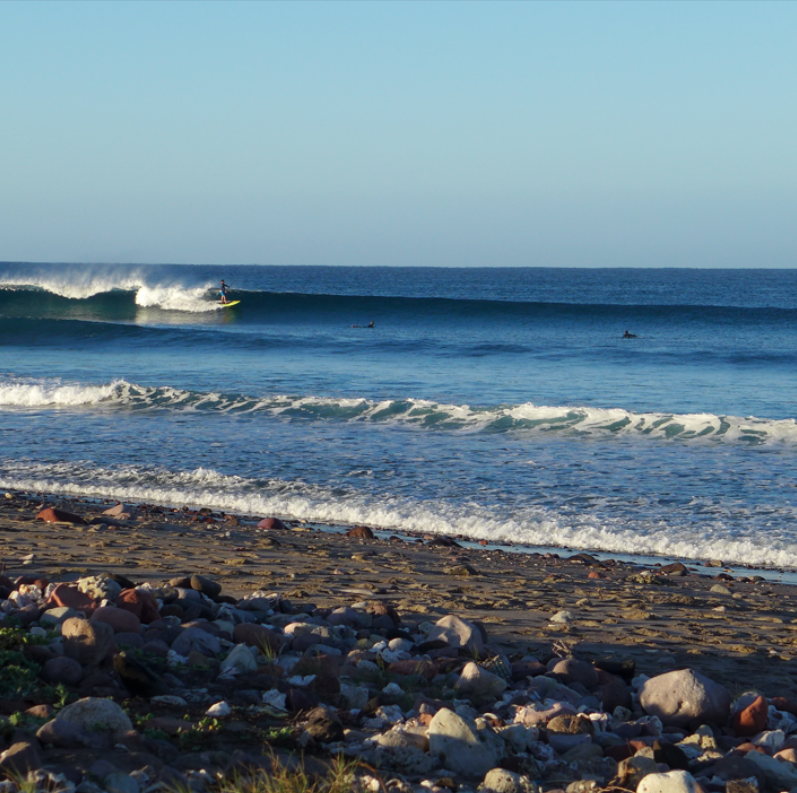 We shared waves and smiles, they chose to surf way up the point and here they are paddling back from a couple of long ones. Myself, I'm kind of sneaky, when someone wants the top of the point, I know there are great waves going unridden further down the point- so that's where I went. Right out in front of our little campsite- open and empty. I've been traumatized by my mom. Every Christmas she would play a couple Christmas albums and I can't shake two of those songs from my head. One is "Blue Christmas" by Elvis, the back up singers make the weirdest cooing sound on that track. I hate it. The other album had all kinds of wacky songs on it- wacky meaning traumatic. The leader of that hideous hit parade was a gem called something like, "All I want for Christmas (is my two front teeth)". I remember the cover of that album (some kid who was a hybrid cross between Alfred E. Newman and Opey wearing a jaunty Christmas cap with his mouth open to show his bright new chompers.... just thinking about it makes me feel all dirty inside). So, appropriately on Christmas morning this little refrain played through my skull again and again..."All I want for Christmas is my full wrap around, my full wrap around... and I would wish you Merry Christmas!" 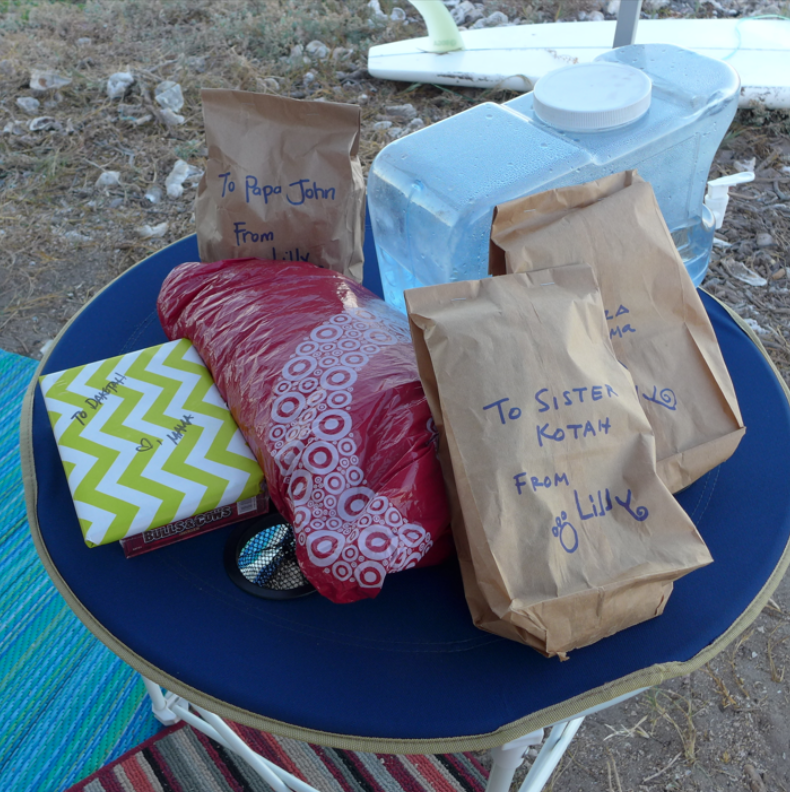 Of course, to complete a perfect morning (which also included a delicious spam and egg breakfast prepared by Dakotah and a mug of hot black coffee waiting for me at the campsite) there were some gifts, all from my dog Lilly, waiting for us/me. I was stoked, what a great way to spend Christmas! In fact, spending Christmas Eve around a beautiful beach campfire and surfing Christmas morning is my idea of a perfect Christmas. Well, I was also given a sweet new coffee mug- covered with pictures of West Highland White Terriers (my girl Lilly is a Westy) which blew this year's Christmas's ranking into the stratosphere; it's the small things I tell you, that's what matters. 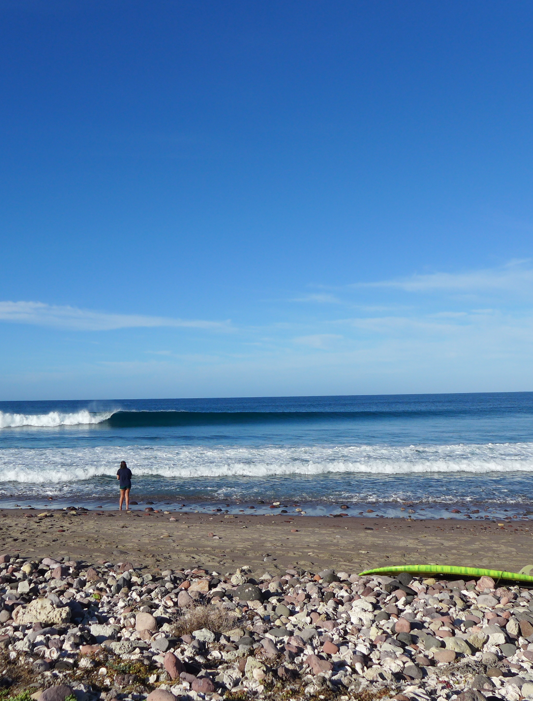 The surf might not have been on the all-time-perfection meter but I was mind-blown at the clean little wrappers peeling down the point- and flying over the cobbles on water that looked like liquid glass- it was enough for me. I've said it before, "life is what you make it", a mantra I know to be true.